Batley players Tom Pitchforth, Matthew Adams, Nathan Archer, Adam Coote, Emma Pitchforth, Fiona Maynard, Abby O'Brien, Abbey Calvert, Shellby Stephenson will represent Great Britain at the World Championships. Batley based Great Britain octopush players had a visit from MP Tracy Brabin on Sunday. Nine Batley players have been picked in the Great Britain squad for the World Championships to be held in Tasmania in July. Batley octopush club held a race night last Saturday as a fundraiser to help Tom Pitchforth, Matthew Adams, Nathan Archer, Adam Coote, Emma Pitchforth, Fiona Maynard, Abby O’Brien, Abbey Calvert and Shellby Stephenson with costs to fund their trip. Several of the older players have also qualified as octopush referees and were on hand to help out at an Under-14s tournament, sponsored by Robin Hood Watersports. Batley had 21 players playing in three different teams, while they also faced opposition from Rochdale in a tournament played over periods of eight minutes each way. Batley Sharks claimed the gold medal, beating off competition from the Batley Dragons and Tigers, along with the representatives from Rochdale. It was a first taste of competitive octopush — or underwater hockey — for many of the Batley players, some of whom could figure in the National Championships, which will be held at the John Charles Centre of Sport, in Leeds, in July. Octopush is played on the bottom of the swimming pool with players wearing a mask, fins and snorkel as they push a lead puck along the bottom. The aim is to score goals in gullies which are at each end of the pool. Anyone wanting to try octopush should be at least eight years old and a confident swimmer. 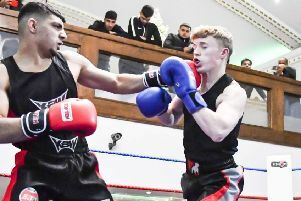 The Batley club have become established over many years and training sessions are held on Sundays from 5pm to 6pm at Batley Sports and Tennis Centre, who can provide further information.